This post by Calculated Risk was a shock to us on the demographics behind student loans. During the housing bubble you had an asset, but these loans have no real collateral (paper diploma) that make this a very concerning issue. New research from the Federal Reserve Bank of New York shows that Americans 60 and older still owe about $36 billion in student loans … More than 10 percent of those loans are delinquent. As a result, consumer advocates say, it is not uncommon for Social Security checks to be garnished or for debt collectors to harass borrowers in their 80s over student loans that are decades old. The outstanding student loan balance now stands at about $870 billion,1 surpassing the total credit card balance ($693 billion) and the total auto loan balance ($730 billion). With college enrollments increasing and the costs of attendance rising, this balance is expected to continue its upward trend. Among people under thirty years old, 40.1 percent have outstanding student loan debt. Among people between the ages of thirty and thirty-nine, 25.1 percent have outstanding student loan debt. In contrast, only 7.4 percent of people who are at least forty years old have outstanding student loan debt. 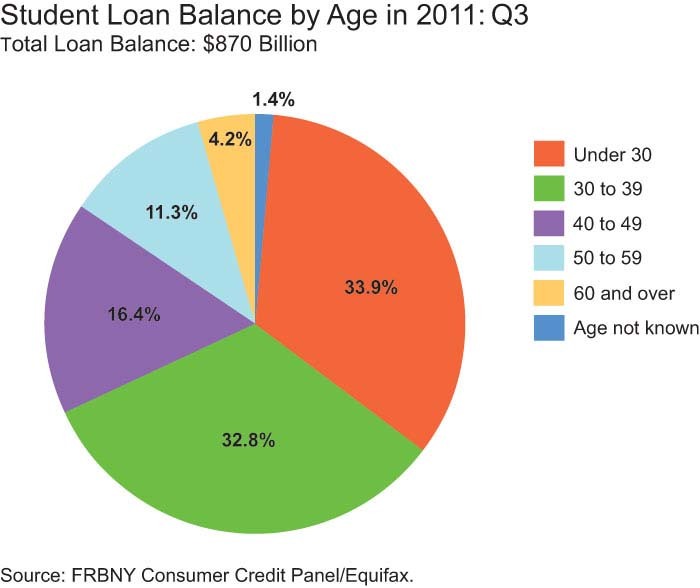 As a result, $580 billion of the total $870 billion in student loan debt is owed by people younger than forty.